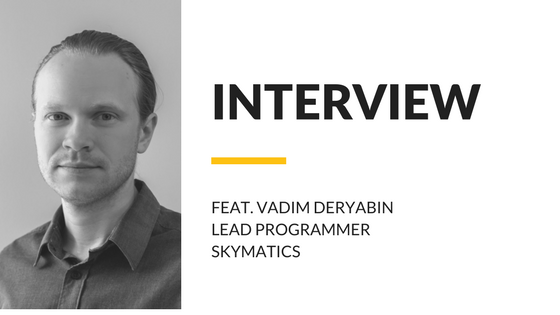 Vadim Deryabin is the lead developer at Skymatics. Born and raised in Russia, he received his Engineering Degree from the Ural Federal University before immigrating to Canada. Along with being a chemical engineer, he is a software developer with experience in multiple industries. Vadim, you have an engineering degree, but all the skills of a software developer, how did you become both? I spent more time on my Bachelors of Science, but I put in more effort toward my continuing education. I was very motivated to get my software development skills. You’ve said that part of the reason you chose to immigrate was to find opportunities and live an interesting life, why did you choose Canada? Because I could! Seriously though, I started my application to Australia because they were in need of people with my engineering background. During my application, Western Australia changed the list of in-demand professions and engineers were no longer needed. I decided ‘I could check Canada’. Walk me through the steps of your career that got you to Skymatics. I considered immigrating when I was a student. In order to qualify for immigration, I knew I’d have to be an expert in a profession that requires a Bachelor of Science. I became a civil engineer, applied my knowledge and dove in deeper to gain expertise. I built/coded a database for building materials, using logic and many applications to calculate optimized cuts to have less leftover materials. As it turned out, I would come back to these coding skills later in my career. I started with Navteq in 2010 as a Geographic Analyst working on a geographic database and field operations. The job was really interesting and it was my first time experiencing being part of a great team. It wasn’t like my previous positions where everyone does their jobs and goes home, it was a really great stage in my life. Maybe I needed to prove myself? When I immigrated here, I started with Stewart Weir as a technologist. They valued my skills in drafting and engineering calculation. I was initially in the powerline department and later switched to pipeline department. Opus acquired Stewart Weir, they became Opus Stewart Weir, the company was trying to find new markets. While I was a technologist there, I was reminded of my previous efforts with coding, maybe I needed to prove myself? I spent a couple years in the continuing education program at SAIT. At the same time, I took a number of courses online from Universities in the USA. I’d considered myself a backend developer. But as I developed my own projects, someone had to make front end as well! I forced myself to learn front-end frameworks and now I feel competent on both sides. With my background as a processing engineer, I can envision different systems how they will develop throughout the project. Not just a particular task, but the whole backend process, the visualization on the front end and how they should be tied together. I had this vision for Skymatics right away. What’s your ideal way to start the workday? I skim through all of my task lists and communications to prioritize the tasks of the day. Ideally, I would complete everything and make a presentation, but not all tasks can be completed in half of a day. Sometimes, for example, a bug appears after several days or something crashes, requiring my attention. But my ideal day would be when I complete the majority of tasks and everything works neatly, nicely and efficiently. What is your favorite thing you’ve done at Skymatics’? What is your biggest contribution to Skymatics? I’m the Lead Developer, the one who can wrap all the scientific process with the business logic and create a number of applications that everyone can use. I know what direction should we take in order to achieve our goal, and will always continue to do research and development. In 5 years I see myself having built a number of complex applications. But what role would I have at this time? I have no idea. I don’t want to switch to something particular, like managing or architecting or something. There are new technologies and tasks appearing all the time and in order to master them you learn new approaches, you communicate with new people. Where do you see technology going? Let’s take new languages as an example, why do they appear? Because people want to solve problems within existing languages and frameworks. Currently, I’m interested in a functional language called Elixir and framework called Phoenix. It’s pretty similar to what we use right now, but faster. If a child walked up to you and asked for your advice on life what would it be? 42. Laughs. No, I recently watched, “Hitchhiker’s Guide To The Galaxy”. So the answer is 42. To be serious, there is no one answer to all questions and problems. I would say that the details matter. For instance, are you looking for advice on how to get ice cream, or how to get yourself a house full of ice creams?